Please Note: Will not fit international models (SiR) which come from the factory with a B16A engine. 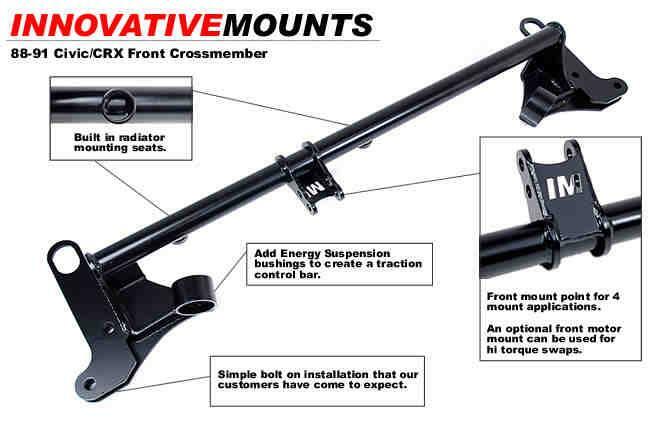 For those applications you would want to use the 90-93 Integra traction bar (Innovative Mounts part# 59311). Some Innovative Mounts products are made upon order. Therefore, please allow 5 to 10 business days for shipment. If you would like to check the availability of a specific part, please e-mail us or give us a call (626) 261-4052. Innovative Mounts Replacement Bushing & Caster Adjustment Set for the Innovative Mounts' 1988-1991 Honda Civic/CRX (ED/EE/EF) Crossmember Part # 59103 Designed specifically for the Innovative Mounts Crossmember bar. Innovative Mounts Upper Radiator Bracket for the 1988-1991 Honda Civic & CRX (ED/EE/EF) Designed to Mount 1992-2000 Honda Civic Style Radiator. Innovative Mounts Conversion Front Mount for 1988-1991 Honda Civic or CRX (ED/EE/EF) Part # 19140 Designed to fit the Civic/CRX ED/EE/EF chassis with B-Series engines and cable transmission.